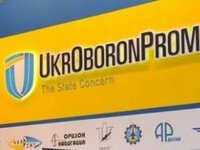 The Ukroboronprom State Concern has dismissed Director of Mykolaiv Armored Plant, which is part of the concern, Mykola Kistrin for delay in paying wages at the enterprise, the press service of the concern reported on Tuesday. Today, the salary debt for two months is recorded over long-outstanding payables under contracts with the Defense Ministry. "This resulted to the fact that the State Treasury Service does not approve payments under current contracts with the Defense Ministry," the concern said. "The improper implementation of the state defense procurement order in the conditions, when the country is involved in the war, is inadmissible. This causes direct damage not only to the defense capability of Ukraine, but also to the enterprise itself, which remains without valuable specialists because of delays in wages. Taking into account the fact that this inefficient management of the enterprise will lead to even greater problems, I decided to release Kistrin from his post," the press service said, citing Director General of Ukroboronprom Pavlo Bukin. State-owned enterprise Mykolaiv Armored Plant repairs and upgrades armored vehicles. The enterprise also designed some models of armored vehicles.